In follow-up to Part 1, which described how Bubble Charts help to identify potential black holes in a review process, here in Part 2 I’ll talk about our BC PSLS Analytics tools and how they can be used to retrieve meaningful data for healthcare settings across BC. Today, there are over 500,000 safety event records in our BC PSLS database from across all Health Authorities (HAs). More than 600 healthcare facilities with over 5,000 specific locations are actively reporting these events into BC PSLS. Depending on the complexity of the organization, pulling data from our database and delivering it in a meaningful way to clinical leads and executives can be an enormous burden for some of our users. We want healthcare providers to spend more time with patients, not compiling data about safety events in their area! We knew there had to be a better way. We know that various groups across the province struggle to pull BC PSLS data and convert it into meaningful and actionable information for their area(s). These reports are shared with colleagues, managers and executive leaders but, sometimes, horror stories about the length of time it takes to build reports trickle into BC PSLS Central Office. We’ve heard that the main problem is almost always about the number of different locations BC PSLS users are responsible for and all the combinations of how to ‘slice’ the data. In all HAs, specific locations may be shared by different departments (e.g. Emergency, Medicine, and Laboratory), which makes the challenge particularly daunting. For each Department/Program at an HA, build a monthly report: There are about 20 to 30 major programs at each of the 7 HAs (7 x 20 = 140 reports). A report at this high level would only be useful to an executive or program leader. For smaller facilities there might be only one program (e.g. Residential Care): But there are 50 facilities in the 7 HAs that need the report (7 x 50 = 350 reports). Large acute sites slice by program first and then look at how the Units operate: There are hundreds of ways this data could be examined. Now we can make this problem even bigger by throwing in Category-specific (Fall, Medication, Blood Transfusion, etc.) reporting. Examples of users who need this sort of view are falls prevention leaders who need targeted reports about what patients were doing before they fell, laboratory and transfusion teams that require detailed information about the process stage when problems occurred, and wound care management specialists that need to know Braden Scale scores. There is a method to solve this problem and that’s where BC PSLS Analytics comes in! The true power of our analytics website is its ability to ‘push out’ BC PSLS reports based on dynamic criteria. 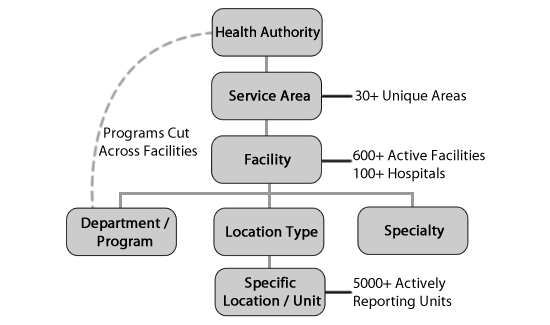 We can design a single report based on a location (Facility, Program or Service Area) and then ‘loop’ through all the locations below it. This feature allows us to design a small number of reports that can then be applied to hundreds of different scenarios. Falls are the most commonly-reported event category in the province and occur in almost all facilities, so that’s where we began. 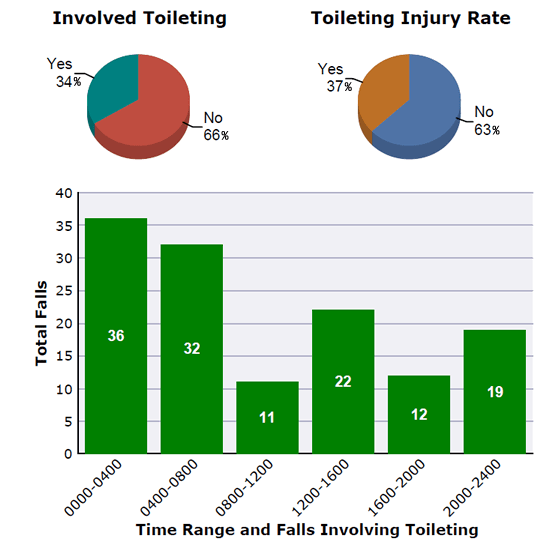 We designed a report to examine falls at a facility and then loop through all the units in the facility. The result is a large report, but it’s delivered in an easy-to-search format. The real benefit is that frontline staff can quickly look at the information for just the units they work on. After a brief pilot, we launched “BC PSLS Publications” across the province in March 2013. Each month, subscribers receive a report for their area. There are 15 reports that handle ALL of the location and category-specific requirements described above. In November 2013, we will push out close to 800 reports to users across the province. This function has relieved a lot of the burden of report design on BC PSLS users and gives all users access to one consistent method of data review. Everybody can start with the same standard report and then dig deeper. Thank you for your comments, Tammy Simpson, our tireless FHA Superhero! Published reports are not dynamic and often lead to more questions, as the business requirements are never going to be the same for all users. As mentioned in Part 1, our Explorer tool can slice and dice data any way users want. For example, upon learning that many falls occur at night and often involve toileting, a user could show the “Top 5” units in the facility (those with the most falls of this type) and break that data down by severity of the event (degree of harm to the patient) to determine where the priorities are for targeted efforts to prevent falls and reduce injuries. 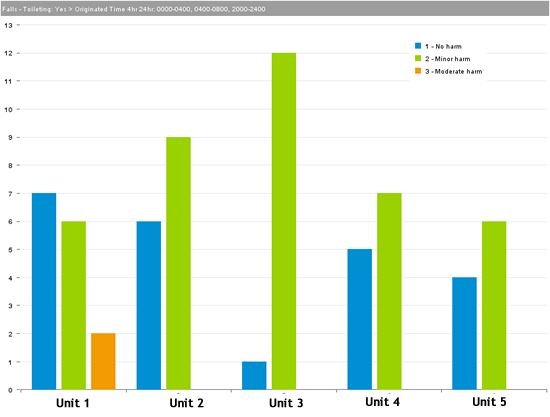 BC PSLS Analytics offer flexibility in the kind of data you can retrieve and visualize. But we have only scratched the surface of what is possible. We are continuing to work with highly-specialized teams to create more customized reports. Our goal is to build simple solutions for complex problems and then get those solutions into the hands of any healthcare worker in the province that needs it. We can use the problems of the past to improve and shape the future of patient care. If you have questions about how to use BC PSLS Analytics, please contact the BC PSLS Coordinator in your Health Authority. Darren Frizzell is Business Development & Information Systems Analyst at BC PSLS Central Office. His work focuses on using analytics for process management and quality improvement. To learn more, please contact Darren Frizzell at dfrizzell@phsa.ca.